We at Decent Christian Talk wanted to devote some time in the month of February to the human trafficking problem with a series on different organizations and efforts to abolish modern slavery in our time. More people, 30 million, are living in slavery today than at any other point in time in history. The types of slavery include forced prostitution, labor without pay, labor for little pay, and others. Women, men, and children alike are victims of a 150 billion dollar industry that seeks to profit off of the most selfish of desires that plague our species. We will continue the series through February as we highlight several non-profit organizations and their efforts to shine light into a seemingly unending dark hole of society. We caught up with Ethan Batstone from Not For Sale to discuss their efforts. Ethan serves as the Director of Engagement at Not For Sale. Not For Sale was founded by Dave Batstone after encountering the effects of human trafficking firsthand in his home state of California. A local eatery he went to was shut down when he stopped by. After discovering that the other locations had also been shut down, he found out that the restaurant had been shut down due to trafficking young women. This has led to his lifes work of exposing and rescuing those among us who are truly defenseless. 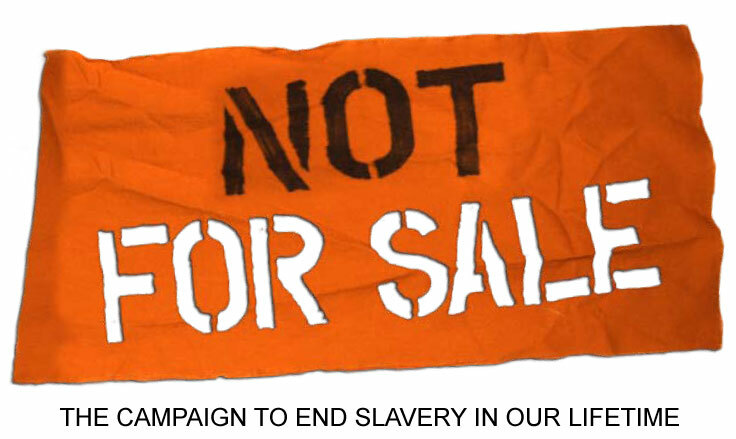 Not For Sale has been featured in countless interviews and documentaries and is at the forefront of the new abolitionist movement. DCT: Ethan, thanks for taking the time to talk with us. Tell me about the work that Not For Sale is currently doing and how the movement has grown. I first heard of Not For Sale when there was a partnership between your organization and The Wrecking on a tour that used their music and yourself as a presenter to bring awareness to the plight of those in slavery. Not For Sale incubates business ideas to help empower some of the world’s most vulnerable communities. that we want to give up on the everyday person and we still are providing action steps that people can adhere to, but how do we hedge our bets on “if we only have so many people and ‘X’ amount of dollars how do we get the most bang for our buck?” So we began to target CEOs and higher ups that run major corporations. It’s through their supply chain that we have the opportunity to affect change. That then affects change throughout their whole company. Beyond that, we started to look at other companies as they emerged as to how we could partner with them to give them the tools as they build their business to do good for those who make their product and do good for the environment from which they come. How we work with survivors has changed. Our projects that were already in place are still the same, such as Thailand, Amsterdam and Romania. There is still a very large need to help those rescued with immediate medical attention and after care and things like personal development. What we are finding here in the United States in larger cities, where the issue exists, is that the resources already exist. They may not be well funded but they exist. We did a study on our own backyard in the Bay Area of California and we found that every one of these facilities were coming up on the exact same problem. They all can take care of those immediate needs and they can take care of the boys and girls that they interact with, but only up until a certain age. After they turn 18, they age out of the system. Most of them operate with funding that comes from the state and they are not able to provide services after a certain age. These individuals have not had childhood education or had a job before. They basically have no opportunity to have a chance to succeed. Sixty-five to seventy percent of them end up going back into the life that they were in before because it’s familiar to them and there is some semblance of safety in their mind regardless of whether or not there is the reality of that safety. So we asked what could we do in that interim. We did a feasibility study working with those facilities in the bay area of what those needs are and how we could fix that. There are two parts of this. We created a six week course working with the providers at the different locations working with young women. It starts day one, with establishing self worth, identifying skill sets, and assuring them that there are people that care for them. Also we work on how do we define dignified employment in contrast to where they may have come from. How do you have the economy if you are given access to provide for yourself? What we found was that they were not wanting a handout, they wanted dignified employment. Because to them, they could pull themselves up if they were just given that chance. So we began with those basics and then worked on resume building and interview skills. We were also able to partner with a number of apparel companies that were able to provide work attire. We teach them about work habits and why it’s important to do simple things like be on time and work 9-5. That is a foreign concept to those in trafficking. On our end we moved our offices to downtown San Francisco so that we were a more integrated part of the immediate culture that we were trying to affect. We are now working with one of our companies that are providing job opportunities for these girls. A lot of these companies have told us that prior to working with us they wanted to and would provide employment to those in need or underprivileged people, but the turnover rate was extremely high due to lack of previous employment or training. But due to the program we are doing with these women, their retention rate is much higher. We have just seen 4 girls who started with an internship a few months ago now having full employment in those companies. And those were from our test pilot program that we ran last fall. The program is called ‘Reinvent’ and it works with 10-20 girls. The results have been very strong so far. We are currently finishing up our second group that is about to graduate. We are running one group per quarter. This next group is a half-and-half mix of those who have been exploited and those that were on the verge of exploitation. Hopefully, if we keep getting better at this and working with them at a different age, we will see the numbers of those who have been trafficked decrease and we will only have to identify those who are on the verge of exploitation and focus on prevention. DCT: How do we identify those who are on the verge of being exploited? Ethan: Good question. We did a nine month study based on those coming out of the shelters and identified what the factors were in their lives. Was their a history of mental or physical abuse in their home? A lot of what we saw was economic disadvantages. Growing up in certain communities and school systems, there was a belief, culturally, that you just didn’t have an opportunity. Then their was the factor of parental units that were continuing a cycle of a belief system. So, a lot of them believed this was their reality no matter what anyone may have said to them. We started to identify neighborhoods where these people were coming from in large numbers. We know that in Mae Sai, Thailand that a majority of those being trafficked weren’t from Mae Sai. We could trace them back to Laos, Cambodia, Burma, and Vietnam. So then we go to those locations and identify why they are at risk. How do we fix those problems and head up stream and make a change? That is what we are doing in the bay area right now and overseas. How do we analyze the data, identify root causes, and affect change? Here in the US the factors are lack of financial access, educational access, and parents who come from the same level. We also identified that abuse in the home was common. DCT: I have seen that NFS has become very creative in their engagement efforts with the community. The organization’s partnerships with musicians and athletes has been growing. Talk about your efforts to partner with these groups and why it is important. Ethan: Right, so we have been doing those grass roots efforts and showing people how they can use their talents and skills to effect change. Whether you are a musician, an athlete, a businessman or a teacher, how can use your passions to aid in this effort? Everyone has something different to offer and we need people whose passions are different than ours to affect change on multiple levels. We need every skill set to make this work. Music allowed us to use people who were passionate about their art and it also spiced up me just talking on a stage. Those events were very encompassing of showing how all of these things can work together. Now we have had to identify the things that do and don’t work. These are things that we loved but maybe were not as effective or bringing in the return on our investment that we would have hoped. That’s always one of the hardest things that any organization has to do. Currently, our Team NFS athletes program is something that is working. We have 40 major athletes partnered with us. Their one time donation is more than what an entire weeks worth of touring can bring in, and the cost is minimal to us. They have a lot of influence on their fan base as well. We have had multiple partnerships and are currently expanding into other sports outside of baseball which is where a lot of this started. But some of those ideas are that they donate so much per action, maybe thats $500 a home run or $100 a strike out. Some are deciding to give one days salary. As we move froward into this year that has a lotos appeal. Acknowledging that there are millions of people in the world who are forced to work without pay and were never given an opportunity to dream, and by contrast theses athletes are paid handsomely because they are allowed to dream and were given those opportunities. So they are trying to help even the odds by giving one day or one games pay to Not For Sale. Its taken off and its going to be the jumping off point to get others involved. And that in turn will lead to how we get people involved that may be part of their fan base. DCT: I know that events like Passion have really stepped up efforts to promote the work that organizations are doing in this work. How important are the faith based efforts to the work of organizations like NFS? Ethan: Vital. People of faith run through every sector we are working with. Who are people that have been leading the movement for human rights for 200 plus years? People who are strongly motivated by their faith and almost predominantly those who follow Jesus Christ in the United States. And that comes from a deep rooted belief that this isn’t just a theoretical concept or a philosophical concept but they believe that its a black and white matter of truth of what is right and what is wrong. You are told by scripture to care for the least of these. When you are motivated by a mandate to look after widows and orphans it becomes part of your calling. There is no motivational speaker that can do better at getting people involved than what Christ asked us to do. DCT: Ethan thank you so much for your time and good luck in your continued efforts to combat trafficking. This entry was posted in human rights, justice and tagged end it, end it movement, human trafficking, ijm, not for sale, slavery. Bookmark the permalink.